>August at 3 Kittens !! I can’t believe that tomorrow is the first day of August and that our move is just 4 weeks away!! Here’s what we have planned for August, our last month at this very old address!! We kicked off our food drive for 2nd Harvest last night at our 3K Club event. Please bring non-perishable food items to the store during the month of August. We will be collecting food items thru August 31st. We are also kicking off our new drive for charitable knitting & crochet. Our new project is to support Cottage Creations (pattern designers in Iowa) in their effort to collect items for the Iowa flood victims. We will be collecting the donations starting now up though October 26th. The drive is for the following hand knit or crocheted washable items: afghans, dishclothes, mittens, scarves, hats, and sweaters for adults & children. After the overwhelming interest in Project Little Lambs, we are excited to see how many items we receive for this project! 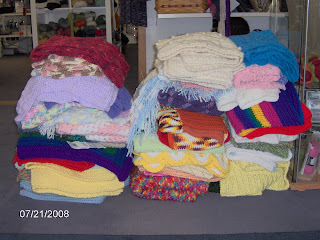 We exceeded our goal of 50 blankets – you donated 61 blankets to the project – Thank You!!! The deals on yarns & canvasses continues throughout the month of August. Buy 3 bags of yarn or canvasses & receive the 4th bag or canvas free (The discount will be taken on the product of lesser value). 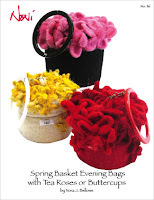 We also have some Louet & ArtFelt kits at 50% off, while supplies last. Hope to see you in the store this month. Have a fabulous August!! >Wednesday, July 30th – Come to the 3K Buffet! >Come to our 3 K Buffet – We will be ‘dishing up the deals’ throughout the store and serving a full course meal of yarns, canvasses & fabrics at prices unheard of….and we are also kicking off our food drive for 2nd Harvest Food Shelves. For every non-perishable food item you bring to the store Wednesday, July 30th, 6p – 8p, for the 3 K Buffet, you will receive a ‘3 cent meal ticket’ coupon to apply to your 3K Buffet purchases that evening! At the 3 K Buffet, there will be lots of fun, door prizes and yummy yarns ~ apertif yarns, entree yarns, dessert yarns….and other special deals being offered only this night for our 3 K Club members. The food drive for 2nd Harvest will continue throughout the month of August. Summertime is typically a time of greater need for the food shelves. We have so much to be thankful for and we think it is important to never forget there are always people in greater need than ourselves. We will also be kicking off a hand knit &/or crocheted items for the flood victims in Iowa. Donations will be due by October 31st. The blankets for Project Little Lambs has been overwhelming. The volunteers at Cornerstone are so thrilled by everything all of you have done to make this project successful. More to come on the charity knitting later this week…keep in touch. I promise to blog more now that we are getting closer to the move, the fall season, our Riverboat Cruise on October 4th, class with Candace Eisner Strick on October 17th….alot to come (like new fall yarns too)! >First of all, let me appologize for the long gaps in our blogging. We have been busy as little bees here at the shop! In preparation for the move we are shuffling things around a bit, not just yarn, but whole shelving units! If you haven’t seen our newest set up you should come check it out and while you are here, you can take advantage of the deals this week. Our ‘Red Wall’ of hand painted yarn is 35% off this week; and of course there is all of the bagged yarn still waiting to be taken home, too. When you buy 4 bags of sale yarn the cheapest bag is free, what a deal! In the needlepoint department you will find your fourth sale canvass free, as well as some deals on some of the needlepoint kits. As though this weren’t enough we also have selected books and patterns half off. Whew! It’s a lot to keep up with, we thank you for your patience as we make this transition. Hey everyone – we are all fast and furiously selling our bags of ‘deal-yarns’ to make room for new yarns coming to the new store – have you been in and checked it out? – you don’t want to be left without a good deal….and the deals just keep getting better! Anyhow… Next Monday, July 14th from 6-8 pm we are doing a Tunisian crochet workshop. We have a few spots left and we’d love to have you join us. Class is going to focus on learning this stitch (some may know it as afghan stitch), learning what to do with it and embellishing it. Class fee is $25.00 and it includes an afghan hook, a skein of Karabella’s Terrain in a pretty “peachy pink”, a pattern, stash buster ideas and handouts. If you sign up and you know you have an afghan stitch afghan – bring it so we can see!!! And remember, you don’t need to know how to crochet to take this class!!! !